Irving Shipyard employees marched to Halifax City Hall this afternoon in search of council's support. The workers are worried Ottawa plans to share some of the maintenance work on navy ships now done in Halifax with a yard in Quebec. 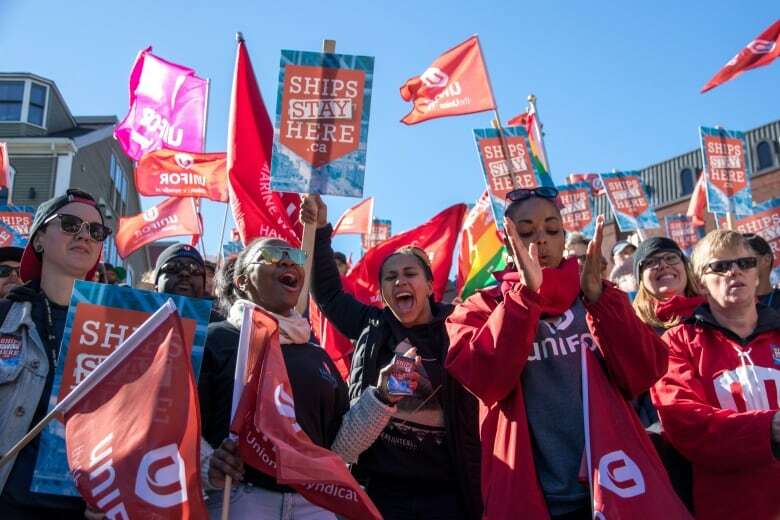 The union that represents Irving Shipyard employees has recycled the campaign that helped build strong local support for its winning National Shipbuilding Strategy bid, a renewed effort aimed at convincing Ottawa to leave well enough alone. It comes in response to musings that the Trudeau government might allow Davie Shipbuilding, located across the St. Lawrence River from Quebec City, to share in some of the maintenance work on navy ships currently done in Halifax. 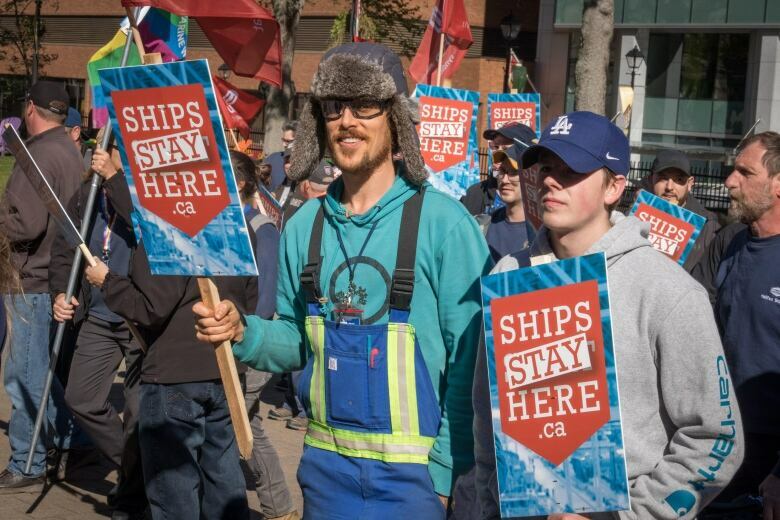 On Tuesday dozens of Irving shipbuilders chanted "ships stay here" — a take on the 2011 Ships Start Here campaign — as they marched from their workplace next to the harbour to Grand Parade in the city's downtown. A resolution was delivered to Halifax municipal council, which supported it. The resolution called on the federal government "to stop its plans to divide maintenance work between the Irving Shipyard in Halifax and Davie Shipbuilding in Quebec, in order to avoid massive job losses and an economic downturn in the region." It also implored Ottawa "to ensure skilled work traditionally done at Irving Shipyard continue to be done there and to support our local workers and their families ." Irving is currently building the Arctic Offshore Patrol Ships and is the prime contractor for the Canadian Surface Combatants project, which federal officials have said will lead to $30 billion in work for the Halifax shipyard. But there is expected to be a two to three-year gap between those contracts, making the maintenance work important to the more than 1,000-member workforce. Before they delivered their message to council, the workers staged a short rally outside city hall. Local UNIFOR president David Baker-Mosher told the group any work lost to Davie would mean layoffs in Halifax. "We need this work," he said. "We do the work on time and on budget." "We should not make a mistake and say politics should override sheer economics." 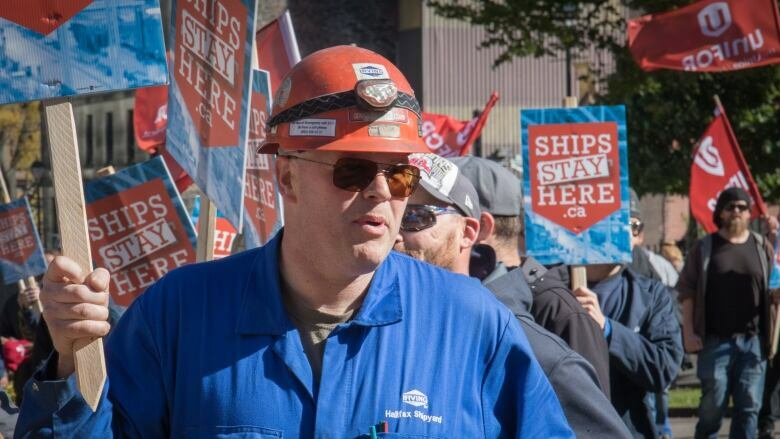 But a vice-president at Davie Shipbuilding, Frederik Boisvert, scoffed at the suggestion Irving and the other shipbuilding strategy partner, Seaspan of Vancouver, had delivered anything on time or on budget. "Despite the billions of dollars that Seaspan and Irving got over the last few years there's zero ships delivered so far," he said from Quebec City. Boisvert also disagreed with the suggestion that sharing the Canadian Navy maintenance contract would mean layoffs in Halifax. "Nobody believes in their right mind that a shipyard whose got that many billions to deliver in terms of ships will have production gaps," he said. "Let's get serious here. If there are production gaps, maybe they've got one thing or two to learn about shipbuilding cause it really doesn't add up." But metal fabricator Adam Hersey, who works for UNIFOR, said that is exactly what would happen. 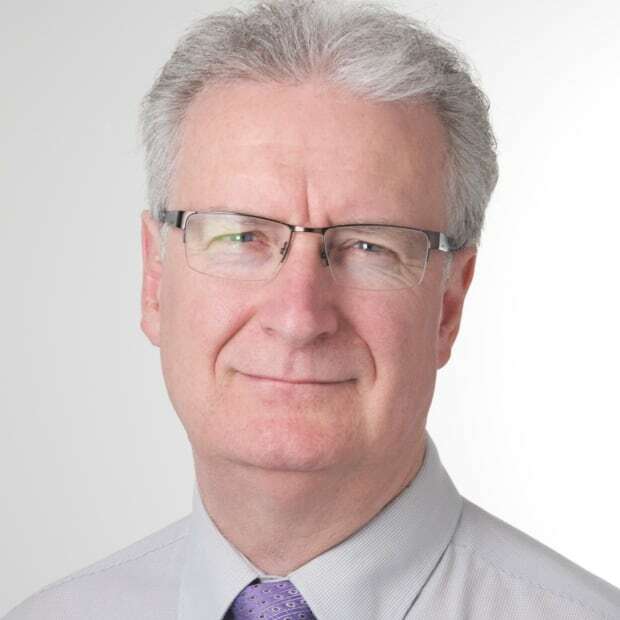 "If we talk about what was the initial intent of the National Shipbuilding Strategy was, it was to eliminate that boom and bust of the shipyard industry," he told CBC. "So in order to retain our skilled workforce which has been heavily invested in both by the province and Canada we have to close the gap between CSC and AOPS as much as possible and doing the day in day out work that we currently do on our Halifax class frigates is just one way to do that." Sean Lewis, Irving Shipbuilding's communications director, has said the Halifax-class maintenance supports 400 jobs at the Halifax Shipyard.